So, the reasoning behind Starbucks’ big logo revamp is apparently to bring the siren (woman/mermaidy thing) to the forefront. But is the siren really the most iconic part of the previous logo? Not to me. To be honest I’ve never really taken much notice of her before today. To me, the iconic part of the Starbucks logo was always the simple, circular block border… and now it’s gone (*sob*). Apparently, they have removed the word ‘COFFEE’ from their logo to allow them to open a new chapter. To venture into new areas of the food and drink market. Which I’m pretty sure they have already been doing successfully while marketing ‘STARBUCKS COFFEE’, no? 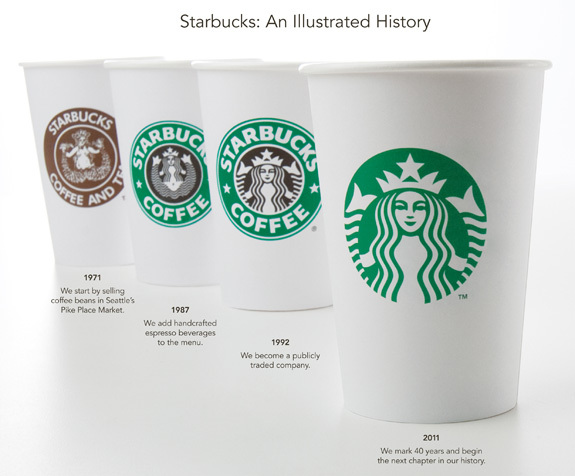 Posted in Marketing and tagged brand, logo, marketing, Starbucks, Starbucks 40th anniversary, Starbucks new logo. Bookmark the permalink.